A lot of aspects of an application can be automatized, for example the generation of stylesheets. As a backend developer, you wouldn't mess up with stylesheets directly with files, but instead, generating them with some PHP code, for example using arrays, is the best option. 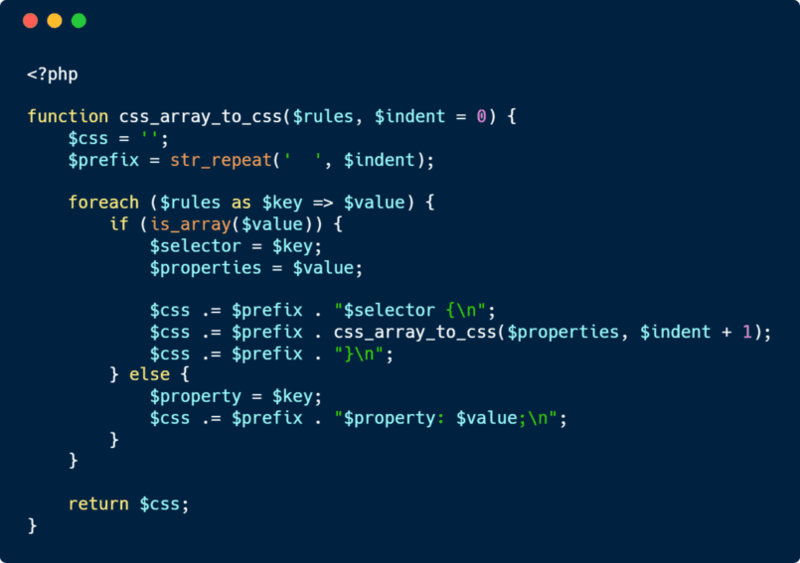 In this article, we'll show you how to generate a CSS string from an associative array easily. * Recursive function that generates from a a multidimensional array of CSS rules, a valid CSS string. *   array('selector' => array('selector'=>array('property' => 'value'))). * @return string A CSS string of rules. This is not wrapped in <style> tags. The function, basically expects as first argument an array that contains either rules or simple properties of CSS, where every key => value that isn't an array will be expressed as key : value;, if the value of the key is an array, a rule of css will be introduced, assuming that it contains more css properties and so on as the function is recursive. This function doesn't belong to Our Code World but to the original article of Grasmash (Matthew Grasmick).